Paper presented by Julius Shemang; he lost his hearing at the age of 16,read Special education but later took up advocacy issues of the rights of the Deaf and other Nigerians with disabilities; he is teacher, writer, publisher and rights activist; he was the first deaf person in Northern Nigeria to establish a newspaper that is fully registered with the Corporate Affairs Commission (CAC) and which serve not only the interest of the disabled but also other Nigerians suffering from one form of discrimination or the other. 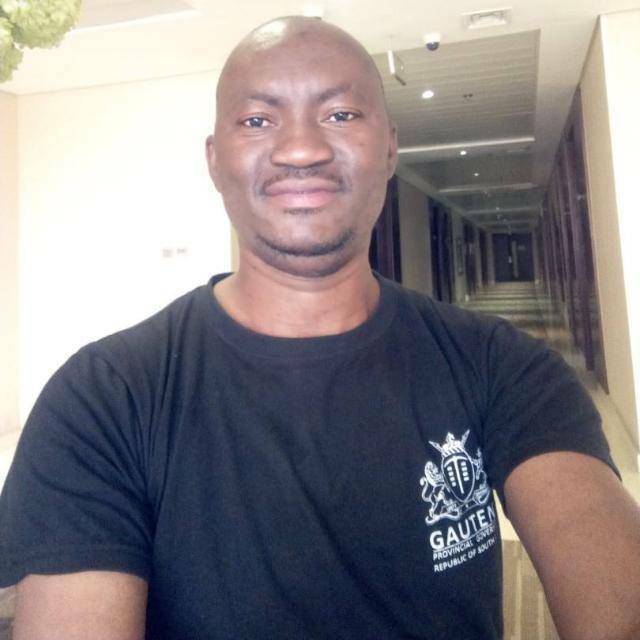 He is the first deaf person to be elected Chairman, Joint National Association of Persons With Disabilities (JONAPWD) Kaduna State Chapter; A member, Board of Directors of the Kaduna State Rehabilitation Management Board; Executive Interim Secretary of the African Deaf Initiative (ADI) Headquarter in Kitwe, Zambia. Before I begin my paper presentation, I wish to congratulate the entire Anambra State Association of the Deaf for enjoying a unique privileged and opportunity to showcase your association strength, love and unity. Thanks to your amiable Governor – His Excellency Chief Willie Obiano, for being a deaf/disability friendly Governor. Particularly, I have been reading about how he has taken Anambra state to the new level. By employing a sign language interpreter as a Special Assistant in person of Hon. Collins Joseph, and other notable achievements brought to the Anambrarians through his regime. I congratulate all of us in deaf/disability community for making a giant stride as we march to freedom. We need those who are deaf/disability friendly to achieve our goal and aspiration of ‘better life and improved living conditions for all deaf in Nigeria’ as sustainable development goals (SDGs) 2030 stipulates. We must continue to press for our freedom and rights. Recently, you are all aware how that our colleagues in Imo state, while staging a peaceful protest and demanding for the office of a Special Adviser to the Governor, were hounded, teargased and brutally dealt with and some of them were detained in the Police cell for daring to exercise their fundamental human rights. The Governor – Owelle Rochas Okorocha, can be said to be the exact opposite of our amiable Chief Willie Obiano. Otherwise, we wouldn’t e gathering here today to celebrate Deaf Awareness Day. Most recent estimates put the Nigerian population at 180 million people with over 300 ethnic groupings and over 250 languages. The United Nations survey reports on disability also revealed that there are 2 billion people living with disabilities worldwide with majority living in developing countries. Going by the UN reports 25.5 millions are Nigerians living with disabilities out of which 9.5 millions are Deaf Nigerians who deserve decent living conditions. From independence in October 1960 till date, the barriers to achieving rights of Deaf persons in Nigeria is being reduced albeit there is still a long way to go to actualize the vision of a society where social justice, equity and fairness to all exists. I shall expantiate various forms through which rights of Deaf persons are being violated in this article. (iv) Severe to profound hearing loss is from 71Db and above. Deafness is also categorise into congenital and sensorineural hearing loss which can also be classified into prelingual and congenital deafness. Deaf and hard of hearing persons, like all other persons with disabilities, have been adequately provided for under the United Nations Convention on the Rights of Persons with Disabilities which recognizes that “persons with disabilities include those who have long-term physical, mental, intellectual or sensory impairments which in interaction with various barriers may hinder their full and effective participation in society on an equal basis with others.” The main concern of deaf and hard of hearing persons is the recognition of their linguistic and cultural perspectives, as clearly articulated by the World Federation of the DEAF (WFD), in its Submission to the CRPD Committee on the Draft General Comment no. 4 on Article 24. Obviously, because of the inability of many in society to understand the means by which to communicate with deaf and hard of hearing persons a lot of misconceptions arise about the way and manner in which to respond to the requirements of such persons. It is hoped that this conference would evolve a roadmap whereby deaf and hard of hearing persons and hearing persons could interact effectively with one another without misgivings on the part of each other. Article 2 of the Convention clearly recognizes sign language as a language of deaf persons. In this regard, states parties are enjoined, under article 21, Freedom of expression and opinion, and access to information, to recognise and promote the use of sign languages. The Committee, in several of its country reviews, tasks countries to ensure that they recognize sign language as an official language of deaf persons. As yet, Nigeria does not have a recognisable sign language which could be given official recognition by law as an official language of deaf persons in the country. Nonetheless, with reference to article 21 of the Convention, which Nigeria has signed and ratified, there is a lot that can be done to mainstream deaf persons into the society. First of all, all information provided to the general public, should be made available to deaf persons in an accessible format, timely and without additional cost. Secondly, the need to Accept and facilitate the use of sign language in official interactions meaning that all official and public engagements should have the services of sign language interpreters to enable deaf persons to participate effectively and thirdly, the media must be encouraged to make their services available to deaf persons through the use of sign language on television, especially. The use of sign language on Nigerian television, whether public or private, is today very limited thus excluding deaf persons from public information. This is unacceptable as it is also closely linked to goal 9 of the Sustainable Development Goals which requires states parties to “significantly increase access to information and communications technology and strive to provide universal and affordable access to the Internet …” Of grave concern to the CRPD Committee is provision made by states parties in situations of risk and humanitarian emergencies as provided for in Article 11. Some states parties, particularly within the European Union, have provided hotlines in cases of emergencies where deaf persons can have access to support services in such situations of risk, humanitarian emergencies and natural disasters. Deaf persons are equally prone to situations of risk in Nigeria, but the National Emergency Management Authority (NEMA) is yet to develop any such hot lines where deaf and hard of hearing persons could be assisted in times of emergencies and natural disasters. Like other persons with disabilities, deaf and hard of hearing persons, have a right to quality inclusive education, on an equal basis with others, but which takes into account their special requirement of learning through sign language. General Comment no. 4 on Right to Inclusive Education (art. 24) recognises that many states parties have been failing to make appropriate provision for persons with disabilities, including deaf persons. In para. 34 (b) of its general comment no. 4, the Committee enjoins states parties to ensure that “Deaf and hard of hearing students” are “provided with the opportunity to learn sign language, and measures taken to recognise and promote the linguistic identity of the deaf community” as well as providing accessible services to hard-of- hearing students, through the use of induction loop technology and captioning. It must be noted that education is the key to enhancing the dignity of the person with disability, which can be achieved through an inclusive quality education environment and which is closely linked to Goal 4 of the Sustainable Development Goals that enjoins states parties to “Ensure inclusive and equitable quality education and promote lifelong learning opportunities.” The CRPD Committee differentiates education in terms of exclusion, segregation, integration and inclusion. According to the Committee “Exclusion occurs when students are directly or indirectly prevented from or denied access to education in any form. Segregation occurs when the education of students with disabilities is provided in separate environments designed or used to respond to a particular or various impairments, in isolation from students without disabilities. Integration is a process of placing persons with disabilities in existing mainstream educational institutions, as long as the former can adjust to the standadised requirements of such institutions. Inclusion involves a process of systemic reform embodying changes and modification in content, teaching methods, approaches, structures and strategies in education to overcome barriers with a vision serving to provide all students of the relevant age range with an equitable and participatory learning experience and environment that best corresponds to their requirements and preferences. Placing students with disabilities within mainstream classes without accompanying structural changes to, for example, organisation, curriculum and teaching and learning strategies, does not constitute inclusion. Furthermore, integration does not automatically guarantee the transition from segregation to inclusion.” Thus Exclusion occurs in such instances where parents of children with disabilities deliberately hide their children at home, not allowing them to receive any form of education; Segregation occurs in special school settings; Integration occurs in various schools where children with disabilities learn in the same classrooms with able-bodied peers but without the necessary reasonable accommodation and are themselves required to make their own adjustments.” Considering the serious shortage of sign language specialists in the country, deaf persons are losing out in terms of quality inclusive education. Sign language special teachers must be given full employment in all public and private schools where deaf and hard of hearing persons are given inclusive education. It is suggested here that sign language should be made a core subject in the educational system so that deaf persons can effectively communicate with all persons and at all times. The right to health (art. 25) is a prerequisite for the attainment of rights enshrined in the Convention, without discrimination on the basis of disability. In particular, Art. 25 (d) calls upon states parties to “Require health professionals to provide care of the same quality to persons with disabilities as to others, including on the basis of free and informed consent by, inter alia, raising awareness of the human rights, dignity, autonomy and needs of persons with disabilities …” In Nigeria, the rights of deaf and hard of hearing persons to health is a far cry from what is desirable. Many deaf persons, in fact, prefer not to visit health institutions as they are often discriminated against as a result of the absence of a qualified sign language interpreter to convey their concerns to the health official. We have heard of cases where pregnant def women have lost their babies due to lack of prompt care and attention on the part of health officials. The Nigerian government must do all that is necessary to ensure that deaf and hard of hearing persons are adequately attended to in health services. Finally, deaf and hard of hearing persons, like other persons with disabilities, are assured the right to political and public life whereby states parties are to ensure the provision of information in accessible formats in the electoral process. Most importantly, the Convention recognises, in article 4(3), the rights of def and hard of hearing persons to be adequately consulted in decision-making processes that directly affect them. Society has developed in a way that sets up barriers against the full participation and equality of Deaf people on the basis of their different communication mode. The onus is on society to remove those barriers. These include, but are not limited to: captioning and/or interpretation of information and entertainment; technical and human assistance in order to access telecommunication services and systems; education provided in the most enabling environment and in the language best suited to the Deaf person’s needs, skills, and preferences; the provision of devices required for the safety and comfort of Deaf people (including visual signal devices); acceptance, respect, and understanding of the differen needs, language, behaviour and values of Deaf people; and equal opportunity for employment. These and similar rights are protected in Nigeria by the Nigerian Charter of Rights and Freedoms and by human rights legislation both federally and provincially as expressed in the Nigerian constitution. 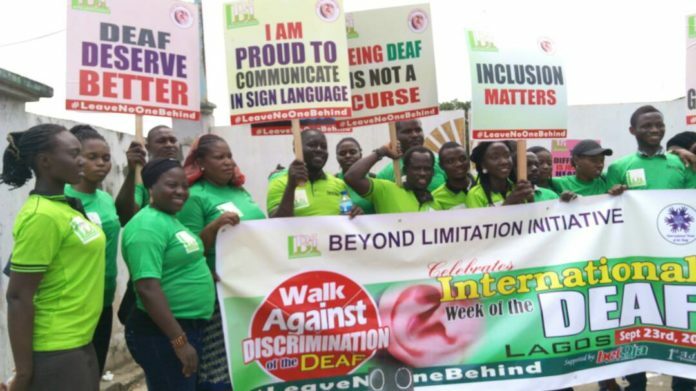 The Nigerian National Association of the Deaf (NNAD) is aware that in Nigeria most violations of the human rights of Deaf people are not deliberate and intentional but result from systemic discrimination, inappropriate priorities, and simple ignorance. The consequences; however, are the same: discrimination against Deaf people on the basis of their deafness. The “unintentional” nature of the discriminatory act does not justify it. The human rights of Deaf people are still routinely violated in virtually all countries, including Nigeria. Furthermore, as the continental Secretary General of African Deaf Initiative (ADI), we are working in partnerships with many oragnisations including AU, ECOWAS, and African Federation of Sign Language Interpreters (AFSLI), to drive home the message concerning Deaf peoples’ rights. We shall carry everyone along in this cause. The right to equality and access. Society has developed in a way that sets up barriers against the full participation and equality of Deaf people on the basis of their different communication mode. The onus is on society to remove those barriers. These include, but are not limited to: captioning and/or interpretation of information and entertainment; technical and human assistance in order to access telecommunication services and systems; education provided in the most enabling environment and in the language best suited to the Deaf person’s needs, skills, and preferences; the provision of devices required for the safety and comfort of Deaf people (including visual signal devices); acceptance, respect, and understanding of the different needs, language, behaviour and values of Deaf people; and equal opportunity for employment. 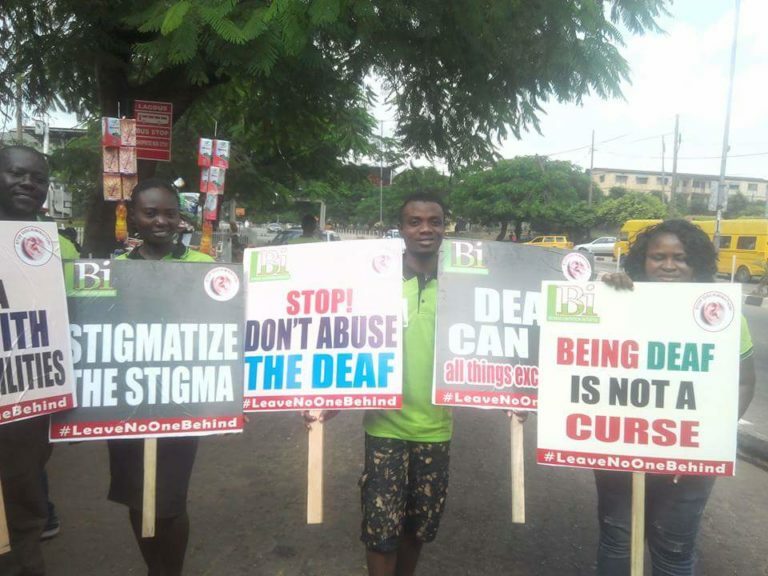 The Nigerian National Association of the Deaf (NNAD) is aware that in Nigeria most violations of the human rights of Deaf people are not deliberate and intentional but result from systemic discrimination, inappropriate priorities, and simple ignorance. The consequences; however, are the same: discrimination against Deaf people on the basis of their deafness. The “unintentional” nature of the discriminatory act does not justify it. Deaf people are human beings and have the same “right to rights” as anyone else. I have looked at but a few of the rights guaranteed to deaf and hard of hearing persons in the Convention on the Rights of Persons with Disabilities. It is important that all civil society and organizations of persons with disabilities join hands to help realise the rights enshrined in the Convention with regard to deaf persons. United Nations Convention on the Rights of Persons with Disabilities, 2006. United Nations Sustainable Development Goals, 2015. SOCIAL INCLUSION OF PEOPLE LIVING WITH DISABILITIES.